1. Very many people were not able to choose what ... they would do but had to take the first ... that came their way. 2. The blacksmith who really knows his ... is hard to find. 3. Many doctors, nurses, and priests do their ... not because it is a means to earn a living but because they feel spiritual ... .
4. Many hands make light ... .
5. The American economy managed to create more than ten million ... between 1982 and 1985. 6. Men of different ... came to America willing to work hard — work with their hands as well as their heads. 7. I'm afraid I have no idea about his present ... . All I know is that he gave up a brilliant ... in advertising and left London. 8. Did you think I was doing all this for the satisfaction of seeing your ... develop? 9. Many writers are known to have first considered medicine as their first ... .
10. The public and private sectors are obsessed with attracting young candidates. Yet there are many ... that would benefit from the maturity and stability of an older employee. Exercise 2. Study the active vocabulary and paraphrase the following sentences using the words and expressions given there instead of the underlined ones (make necessary changes if needed). 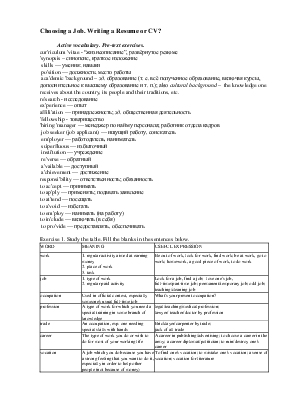 Translate the sentences into Russian. 1. People who want to keep fit go to the gym regularly. 2. A good CV contains all the assessments of a person who is looking for a job. 3. The program participants are given equal chances to receive funds for developing their projects. 4. These reference books can be easily found in the library. 5. The social activities mentioned in the CV indicate that a person takes an active part in the life of the society. 6. The gist of this article can be found on the site of the conference. 7. The words were left unsaid, for they did not seem to need them for understanding. 8. I never saw that a girl could so quickly acquire an ability to drive a car. 9. You should write about your achievements relevant for this job. There are several differences between a curriculum vitae and a resume. 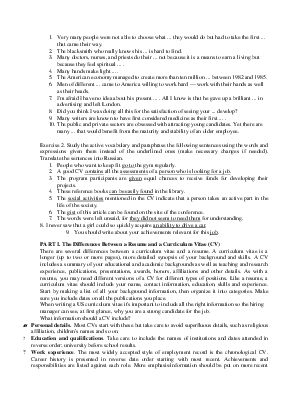 A curriculum vitae is a longer (up to two or more pages), more detailed synopsis of your background and skills. A CV includes a summary of your educational and academic backgrounds as well as teaching and research experience, publications, presentations, awards, honors, affiliations and other details. As with a resume, you may need different versions of a CV for different types of positions. Like a resume, a curriculum vitae should include your name, contact information, education, skills and experience. Start by making a list of all your background information, then organize it into categories. Make sure you include dates on all the publications you place.